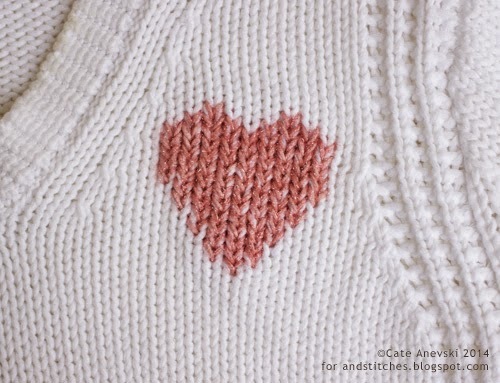 Today we have a tutorial for a special stitch to add embroidered elements to knit fabric. You can, of course, use traditional embroidery techniques with knitwear, but traditional stitches do not have the same stretchiness that knitted fabric has. Enter the duplicate stitch. This is a stitch that essentially duplicates the knitted stitches, giving you the look of knitted color work. The stitch is easy to learn but can give you lots of creative options. Start with a piece of knitwear that has a relatively chunky knit. 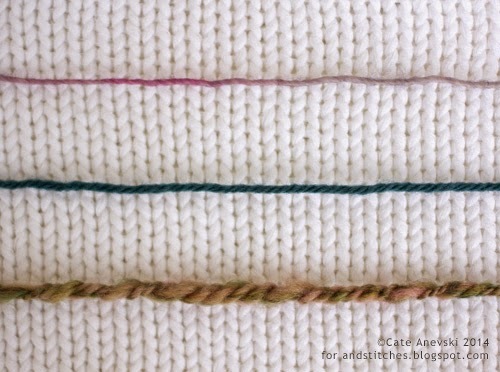 The stitch works best on stockinette stitch fabric, which looks like many rows of "V"s, so make sure your chosen fabric has enough of that stockinette stitch for you to create your design. 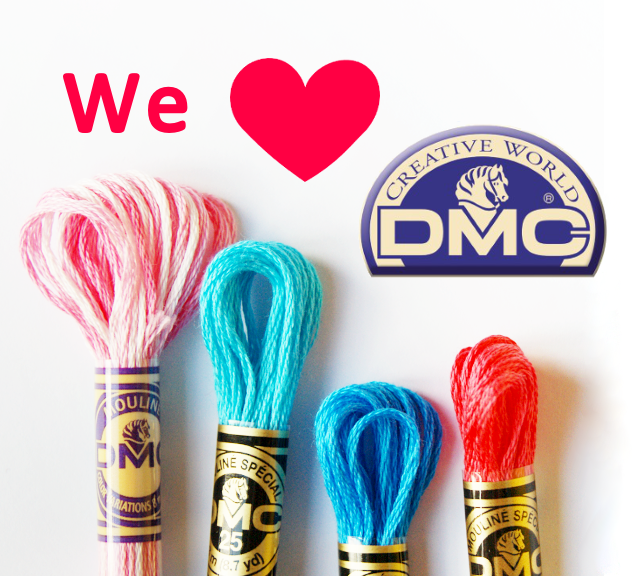 • One, a yarn in a lighter weight than the yarn your knitwear is made of (like the pink yarn above) may not entirely cover the existing stitches, meaning that your background fabric will peek through your stitches. • Two, a yarn in a heavier weight than the original fabric (like the brown yarn above) will cause your design to be very bulky. Both of those options will work just fine, but you may want to experiment to make sure you like the look of the yarn you choose. 1. To start the stitch, bring your darning needle up through the base of the first "V" you want to stitch. You can see in this photo that I have highlighted where this stitch will be. 2. 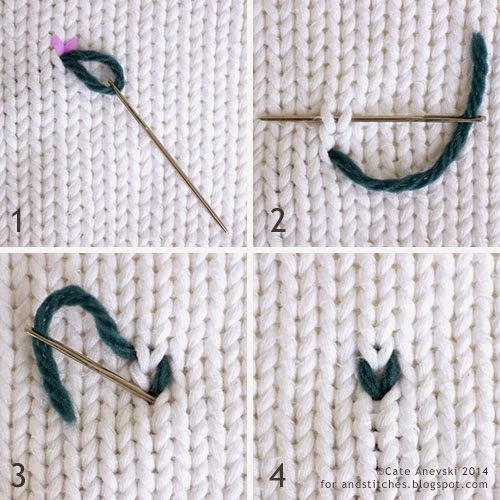 Pass the needle through the back of the stitch you are covering. 3. Bring your needle back through your original entry point at the base of the "V."
4. And that's the completed stitch! Just keep working that stitch to finish your design. To maintain the stretchiness of the original fabric, try to work your stitches in horizontal rows and don't carry your yarn over more than a couple of stitches. Start and stop your working yarn if you need to skip a large area. Be mindful of the tension of your stitches. You want the tension to match the fabric you are knitting. To make it easier to follow your design, I recommend marking the stitches you will duplicate using an erasable fabric marker. I wasn't quite able to both focus on the stitch and keep my design in mind, so I found this to be very helpful. This can be a great way to use cross-stitch patterns, but keep in mind that the ratio of the size of the stitches in knitwear is a little different than in evenweave or Aida fabric. To help you create your design, there are a lot of printable knitwear graph papers available, like this one here. I hope you enjoyed this tutorial and will give it a try. Feel free to share your creations in the &Stitches Flickr group. We'd love to see them!